Milling keyways and slots to size in one cut. Designed for plunging operations. Multi-purpose tool used for slotting and profiling. For finishing of contours at high feed rates where a superior finish is required. For minimum vibration in heavy profile machining. Faster machining up to 1 x D depth of cut. Maximum stock removal at high feed rates in profiling applications. Designed for peripheral milling as a finishing operator. 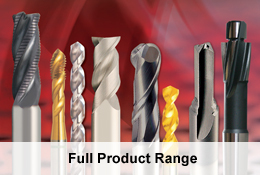 Designed for peripheral milling of contours and complex shapes in hard materials. For roughing and finishing with high metal removal rates elliminating the use of multiple tools. Designed for tougher materials including Stainless steel and Titanium. Milling keyways and slots to size in one cut. Designed for plunging operations. Produces a radius at the bottom of the cut. To produce a true radius up to a quarter of a circle application. To produce a seat to suit woodruff keys. For opening out the bottom of previously milled slot to form a T-slot. To produce opposite section of dovetail slide to Dovetail cutter.